The ECB meeting today will be an interesting affair, even if the main decisions on interest rates and TLTROs were made last month. There’s been a lot of chatter recently about what can be done to offset the side-effects of the now long-term negative deposit rate for banks and whether the ECB will act to shield them. This may be discussed today and I’m sure Draghi will take some questions on it after. Any hikes now look far away though, especially following last month’s moves. Today’s meeting also comes as the IMF sharply cut its growth forecasts for the block and US President Trump threatens tariffs against the EU, further pressuring a region already experiencing a slowdown, with Italy in recession and Germany teetering on the edge. The risks to the downside are clearly building but I think we’ll have to wait longer for the central bank to announce any new stimulus measures, should they prove necessary. Will the Fed go full u-turn? The Fed minutes will also be in focus today, with the central bank having last month lowered its expectations for interest rates to only one next year and none this year. This is quite the change when you consider they raised rates for a fourth time in 12 months in December, a move that raised a few eyebrows as markets were already in meltdown and economic forecasts for 2019 were being slashed. The minutes may not offer too much on top of what was already a comprehensive assessment a few weeks ago. Investors will be keen to see what the prospects of a rate cut are in the interim though, with markets already pricing in one this year. We’ve clearly seen a very dovish pivot from the Fed in recent months but I don’t think they’ll be ready just yet to go full u-turn. It would not reflect well on their decision in December. 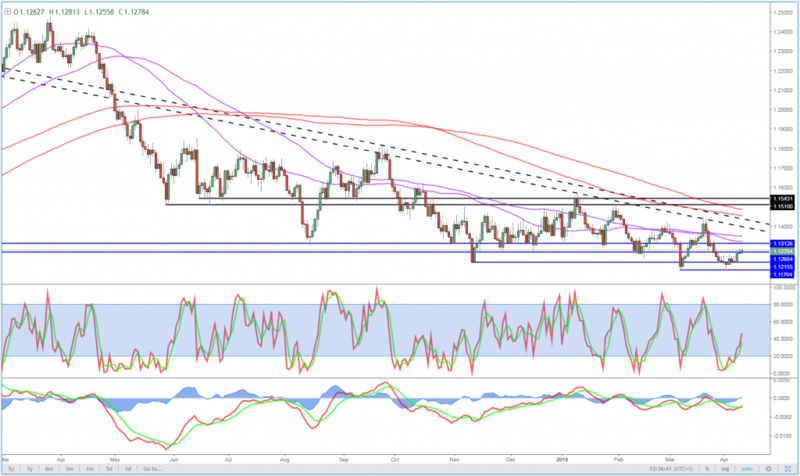 What does two dovish central banks mean for EURUSD? EURUSD has been on the decline since the start of last year when the economic troubles in the area became apparent. While this has slowed gradually, the single currency has continued to make new lows and we’re yet to see any bullish signals. Momentum may be slipping but this is yet to transition into a bullish setup and in this particular case, only a break through 1.14/1.1450 would really get my attention. That’s not to say this isn’t possible but I feel this may be a move that’s primarily USD led than EUR, with the greenback falling out of favour again over the last month.